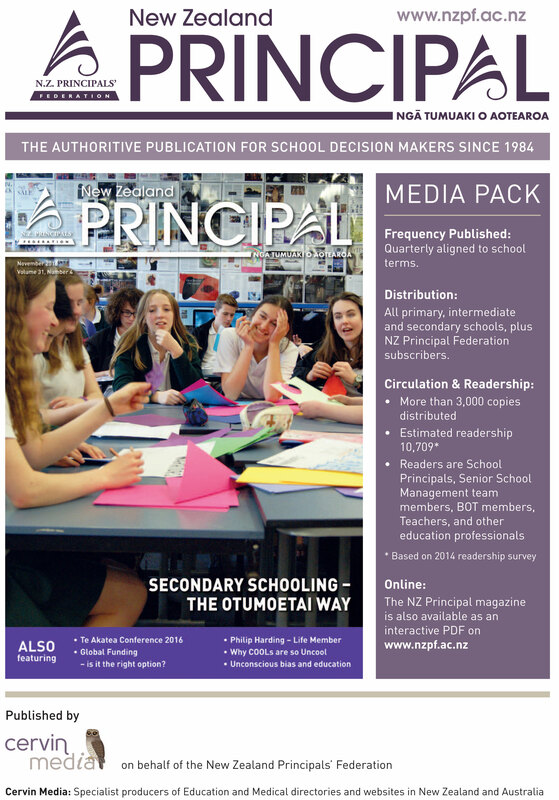 The NZ Principal Magazine has been produced since 1984 and is well respected and regarded by Principals as it contains relevant and topical issues, success stories and opinions. It is the official magazine of the NZ Principals Federation. If you supply products or services to schools, the New Zealand Principal Magazine enables you to get your message directly to the key influencers and decision makers in schools. The magazine is distributed to all schools (Primary, Intermediate and Secondary) through-out New Zealand. The magazine is also available as an e-magazine on this site. Many School Principals, Senior Managers, Board of Trustee members, and Teachers view current and previous issues of the magazine online. All advertising within the magazine is hyperlinked to your website extending your advertising message and reach. Click here to open the NZ Principal Information Pack. This provides a brief overview of the magazine, readership, options, rates and deadlines. To enquire about advertising in the magazine contact Cervin Media on (09) 360 8700 or to contact via email click here.